(6:07) Hand 2 - HJ raises, hero calls with JQo on the BTN. Flop is 9J4 in mult-way pot. (14:01) Hand 4 - Facing 3bet from BTN with KK in SB. Hero calls. (25:06) Hand 7 - Opening with 6h7h UTG. 1 caller, 8hTd5h flop. (28:07) Hand 8 - Opening with AQo from EP. 5J9 flop facing donk bet. (30:35) Hand 9 - Raise Tc9c from EP. BTN calls, Qc7s5c flop. After 15 concept videos and 3 INVERSE vids, this is SplitSuit's first "normal" hand history (HH) review video. What is a hand history review video? If you don't already know, it's exactly what you're expecting – a bunch of tricky hands replayed using a hand replayer with lashings of analysis and advice. This is in the unique SplitSuit style though of course, so expect useful notes throughout and much better structure than your average hand replayer training video. The hands replayed and analysed in this video were submitted by a player from ThePokerBank's facebook page. SplitSuit grades his performance on different aspects of play on a report card at the end of the video. There is no specific theme in the hand history vid, aside from all the hands being tricky spots that you may commonly run in to when playing FR NLHE cash games. 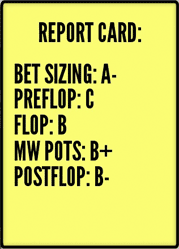 Final report card for the Hero.